Petron Fast Prize Promo ~ Philippine Freebies, Promos, Contests and MORE! 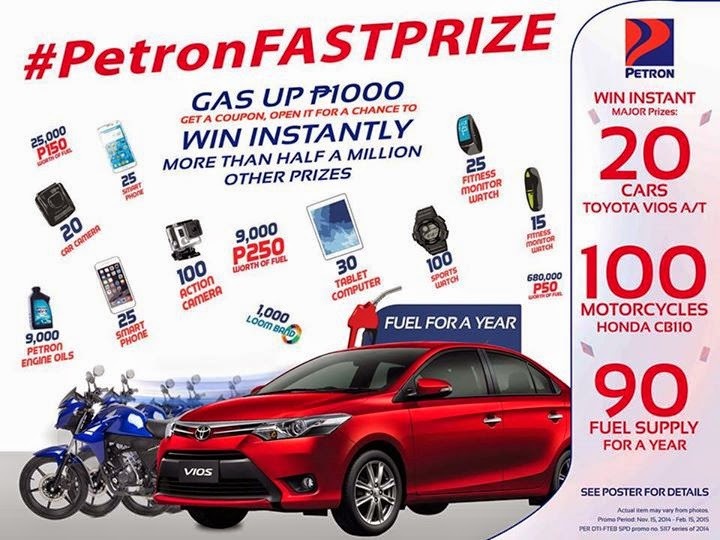 Gas up at any Petron station nationwide and win instantly in the Petron Fast Prize promo. For every P1,000 single or accumulated fuel purchase of Blaze 100 Euro 4, XCS, Xtra Advance, Super Xtra, Turbo Diesel, or Diesel Max, you will be given one (1) coupon. Peel it apart and see if you win an instant prize. 20 Toyota Vios A/T, 100 Honda CB110 Motorcycle, and 90 one year fuel supply will be given to the lucky Major prize winners. Secondary prizes include Go Pro Camera Hero3+ Apple iPhone 6 16GB, Samsung Galaxy S5 with Gear Fit, Apple iPad Air with Retina Display 16GB, Samsung Galaxy Tab 4, HP Car Camcorder F310, Nike Fuel band, Casio G-Shock Watch, and Rainbow Loom Band set. And for the Minor prize, you can win an instant Petron fuel worth P250, P150, or P50. Minor prizes can be claimed at any Petron service station. Major and Secondary prize winners must call the Petron Hotline so you will be advised which nearest Petron station to claim your prize.